This unique event has been developed for Center Parcs by Carat Sport to raise money for SPARKS, the pioneering children’s medical research charity backed by sporting celebrities, and the National Byway Trust, which maintains a 4,000-mile cycle route around Britain, promoting the health and environmental benefits of cycling. The event will be held over four consecutive weekends culminating in a finale at Sherwood Forest in Nottinghamshire and will include guest appearances from Sporting celebrities. Cyclists will be able to take part in a 50-mile challenge ride or a 10-mile family fun ride in countryside around each of the four Center Parcs villages. All rides will be open to members of the public as well as Center Parcs guests providing the perfect way to get active and enjoy the summer with friends and family. The website provides details of the event and allows members of the general public to register to take part in one of the event stages. Registered users can then create an online fundraising page that will allow their friends, family and colleagues to sponsor them online. Other features of the website include an event diary following the Center Parcs celebrity team challenge, a photo gallery so users can purchase pictures from the event and an online ticket system for the charity dinner. We are delighted to have been appointed to develop such a worthwhile website for a national brand of this caliber. Working with Center Parcs is another step forward for Fish Media and demonstrates that, although a small company, we have the experience and expertise to match any larger business in our field. 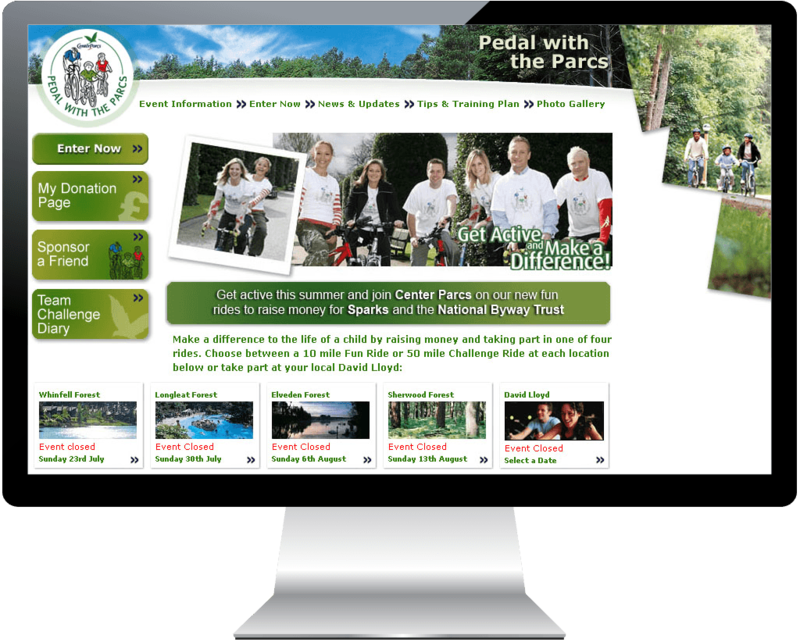 Visit the Pedal with the Parcs website. Sponsor Team Fish Media on our online fundraising page.